NYLCV’s Adriana Espinoza speaking at a press conference to announce the imminent passage of Intro 1465A. The New York City Council’s legislative session ended in a flurry of activity, with Speaker Melissa Mark-Viverito moving a number of environmental bills in the last stated meeting of her speakership. In a capstone to a productive term, bills to address indoor air quality, outdoor air quality, and to require energy efficiency grades in building entrances all easily passed through the Council last week. Here’s a rundown of what the three bills that passed will require, if signed by the Mayor and enacted. Asthma Free Housing Act: Intro 385, which has long been a priority of NYLCV and was featured on our scorecard last year, aims to address indoor asthma hazards. It will require building owners to inspect for and fix allergens that can lead to asthma, such as mold and pest infestations. Emerging research suggests that, even more than outdoor air quality, poor indoor air quality is a leading threat to the health of approximately one million New Yorkers diagnosed with asthma. Asthma is the most common cause of hospitalization for children aged fourteen and younger. This is an environmental justice issue, as children living in low income areas are four times more likely to be hospitalized for asthma. 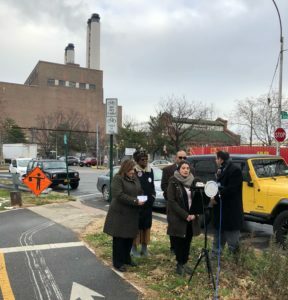 Phasing Out Dirty Home Heating Oil: Championed by Council Members Torres and Constantinides, Intro 1465A will speedup the phase-out of fuel oil grade number 4 in poer plants including those in Western Queens. Fuel oil grade numbers 4 and 6 are a major contributor to pollution in the City, emitting nitrous oxides, sulfur dioxide, and especially particulate matter int our air from combustion in buildings and power plants. These emissions are correlated with higher frequencies of cardiovascular disease, respiratory illness such as asthma and bronchitis, cancer, and even death. Currently, power plants can burn fuel oil grade number 6 until 2020 and fuel oil grade number 4 until 2030. Under this bill, plant owners would have the option of either (1) continuing to burn fuel oil grade number 6 until 20201, but immediately switching thereafter to fuel oil grade number 2 or (2) switching from fuel oil grade number 4 to fuel oil grade number 2 by 2025 (instead of 2030). Energy Efficiency Grades on Buildings: With the passage of Intro 1632A, buildings above 25,000 square feet will be assigned a letter grade based on their energy score, and will be required to post that grade, along with the energy score, in a conspicuous location near their public entrances. This will make information about building energy use easily available to tenants and visitors, including prospective purchasers or lessees, and presented in the easily understood form of a grade. This transparency initiative will equip consumers with already-collected benchmarking data on a building’s energy use. Consumers can use this data to make an informed decision when choosing an apartment or commercial space — just as they weigh other specifications of a building. Landlords will be encouraged to make energy upgrades to achieve higher scores and attract environmentally conscious tenants — reaping financial benefits while the City reaps environmental benefits.